New Jersey is known for having a long history and a great variety of places to get tasty hot dogs of all sizes and styles. 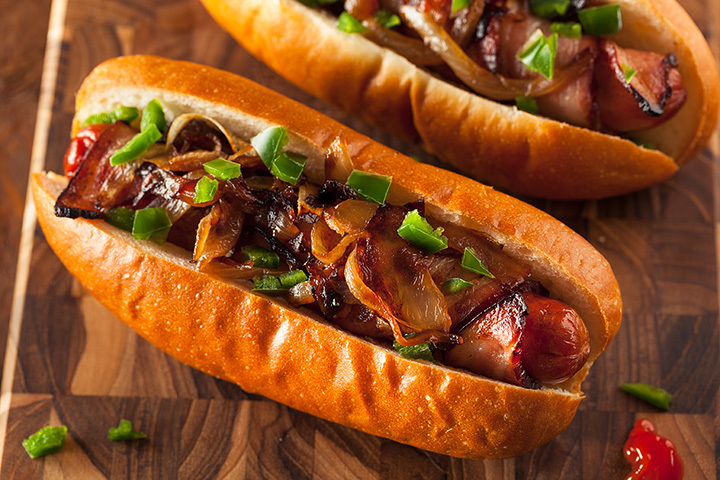 From the Italian hot dog to the Texas wiener, there’s a hot dog to suit everyone, even vegetarian dogs! Your choice of toppings includes the classics like mustard, relish, and sauerkraut but also includes chili, cheese, and potatoes. Whether you want a classic dog or something crazy, New Jersey has a hot dog joint for you. Here are our 10 favorites. Starting in 1930, Jimmy Buff’s is a famous spot in the state because of their creation of the Italian hot dog. This style uses pizza bread and is topped with deep fried peppers, onions, and crispy potato slices. This joint is a great place for your basic “dirty water dog.” You can’t miss it with all the “Randy the Hot Dog Guy” signs posted around it. Italian ice is also available as a sweet dessert to follow a great hot dog. If you’re looking for an old school joint, this is the place their foot-long grilled hot dogs served with cheese on a roll. It’s located neared the beach making it a great spot to grab a bite. Follow it up with a soda and some fries. Galloping Hill is another well-known spot at Five Points (five streets that intersect hence the name) that has a long history of consistently good hot dogs. This classic spot never fails to deliver and is usually packed so be ready to wait for a table. Take a break from the beautiful sunny beaches of Wildwood with this eclectic hot dog spot. Everything is freshly made and they boast a whopping 29 unique toppings from beer cooked sauerkraut to homemade chili. The Destination Dog shtick is that every gourmet dog is prepared in house but prices are reasonable. The creative dogs are hand stuffed, bread is baked in-house, and each dog is inspired by a different place in the world such a Germany or Vietnam. There are also vegetarian dogs! Pair it off with one of their craft beers. Toby’s is a cozy stop on the side of the highway offering the Easton-style hot dog which is a pan-fried dog served with toppings. They also offer other options such as burgers and milkshakes to wash it down. With several locations in Monmouth County, Windmill Hot Dogs is a well-known place to grab dogs, mushroom bites, cheese fries and other snacks. One of their specialties is the Jumbo Dog which is a whopping grilled hot dog with toppings of your choice. They also host fundraising events. This no-frills stand offers one of the best basic hot dogs in the state and is a popular roadside stop. Their meat comes from a nearby butcher, is fried with a family recipe, and then only served with the classic toppings—mustard, onions, pickles, relish, or ketchup. Ever tried a Texas wiener? Johnny and Hanges offers a Texas wiener that will blow your mind and comes with optional mustard, onions, and chili. They also offer a special of buy two, get one free dogs every Monday.